I made my very first Vietnamese noodle soup (without grandma looking over my shoulder) on the eve before New Year’s eve. The Astronomer’s mother adores bún riêu, a northern specialty featuring thin rice noodles, a tangy broth, stewed tomatoes, and crab clusters, so I decided to prepare it for the Chaplin clan while visiting Birmingham. Since this was a spur-of-the-moment idea, The Astronomer and I had to source all of the ingredients locally. Fortunately, a well-stocked Vietnamese grocery store nearby carried everything that we needed, from vermicelli noodles to fermented shrimp paste. Alabama, you surprise me all the time! This recipe, which comes from my Aunt Tina, calls for canned “minced crab in spices” and employs a tamarind powder to achieve the soup’s characteristic sour notes. My dear Vietnamese-Canadian friend Nina prepares an interestingly similar version of the dish. I imagine that these sort of semi-homemade recipes were developed within the Vietnamese community living outside Vietnam during a time when fresh crabs and tamarind weren’t readily accessible or were perhaps too pricy to afford. These recipes continue to persevere even with the availability of fresh ingredients because they’re not only convenient but are legitimately delicious. I was so damn stoked with my first pot of bún riêu that I went ahead and made another vat yesterday at home in Pasadena. My resolution for 2012 is to stop being such a wuss when it comes to preparing Vietnamese foods at home. So far, so good. An hour prior to preparing the soup, soak the dried shrimp in cold water. Drain the shrimp and set aside. In a large stock pot over medium heat, add the oil along with the white parts of the scallions. 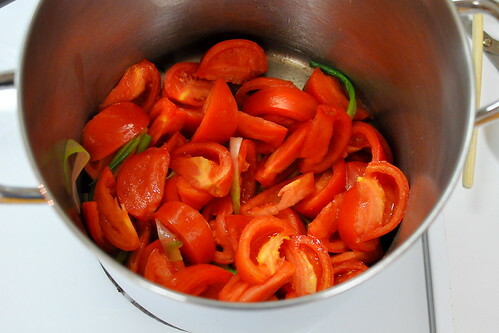 Saute the scallions for 30 seconds, then add the tomatoes and saute for an additional 2 minutes or until the tomatoes begin to sweat. Add the stock or water into the pot and turn the heat to medium-high. Season the broth with fish sauce, shrimp sauce, and tamarind soup mix. Adjust the seasonings based on whether you want it saltier (more fish sauce), sourer (more tamarind), or funkier (more shrimp sauce). Let the broth simmer on medium-low heat while preparing the crab mixture. 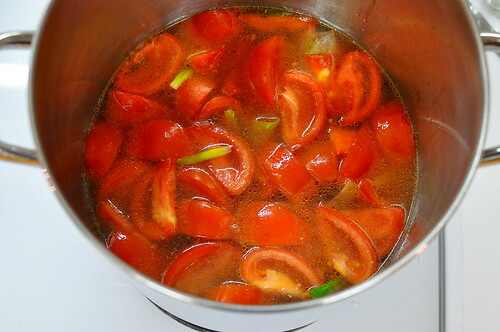 Be careful not to let the broth boil or the tomatoes will turn to mush. Pulverize the dried shrimp using a food processor. Set aside. In a small saucepan over medium-low heat, add the oil along with the minced garlic. Saute the garlic until lightly golden and fragrant, approximately 2 minutes. 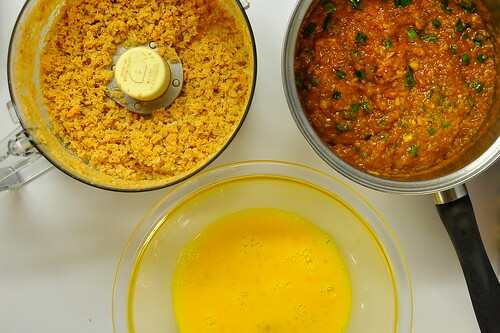 Add the contents of the two cans of “minced crab in spices” to the garlic along with the green parts of the scallion. Continue to cook until the scallions are wilted, approximately 2 minutes. Take off the stove and seat aside to cool. Once the mixture has cooled, add the eggs and the pulverized shrimp to it and combine well. Set aside. Once the rieu (crab mixture) is finished being prepared, turn the broth’s heat to high. When the broth is boiling, pour the rieu into the broth, drizzling it in a complete circle around the pot. 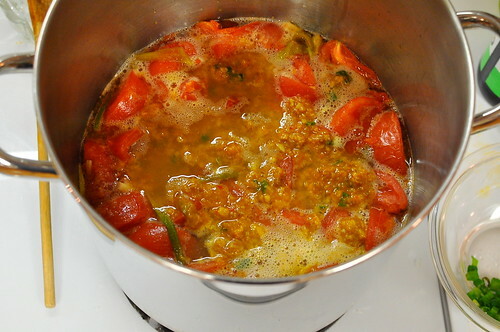 The rieu will instantly begin to form as the mixture hits the boiling broth. Adjust the broth’s seasoning one final time after the rieu has fully cooked. Serve immediately over vermicelli rice noodles (bun) with shredded lettuce, fine shrimp sauce, and lime wedges. 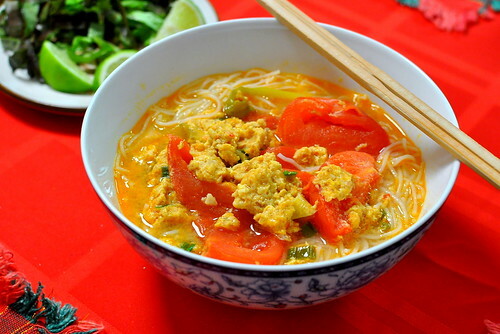 this is also on my list of viet dishes that i must attempt! i am so impressed that you’ve made it, twice already, in ‘bama no less. with the cold that the east coast is experiencing right now, this is the most perfect bowl of soup to tuck into. Mmmm this is making my mouth water… it’s actually a perfect Portland soup… so I will remember this one when you visit :p Love the combo of crab and maters. Keep up the viet cookin! One of my favorite Vietnamese soups of all time. Now if I can just get my mom to make a batch of her version because there is definitely nothing like mom’s. Yum! It’s getting cold here! I don’t know how how our ancestors came up with so many hot soups in the hot weather, but they keep me warm in the winter!! Tamarind soup mix–fascinating. I have no idea what goes into my mom’s bun rieu but I’m sure tamarind soup mix is not one of the ingredients. This looks pretty straightforward, though, so I might just attempt it! 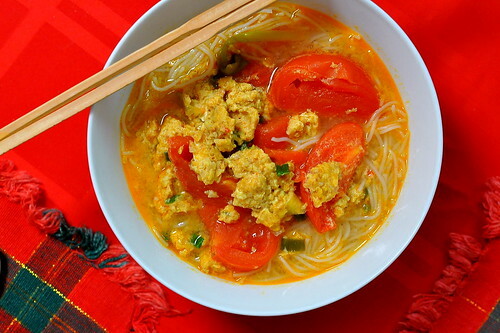 Calvin – I would love it if you found out how your mom makes bun rieu. it looks just as lovely in the pictures as it tasted in life! uummmm. thank you lovely daughter-in-law! That looks amazing! You make it sound so simple, but how long did it take from the soaking the dried shrimp to the first slurp? Sandy – This dish comes together surprisingly fast! From shrimp to slurp, 1.75 hours max. I hope you’ll try it! I just cooked this dish for dinner. I modified it a bit and added pork spareribs. I boiled the ribs on a separate pot when it cooked I added them to the Bún Riêu Cua pot. For say, I’m not vietnamese but my husband who is, said it was very delicious. It taste like how his family makes it. kiddos for me 🙂 and thank you for posting this recipe. Pingback: Recipe: Bún riêu (A Labour of Love) | live.love.obsess.